Xiaomi today officially launched Xiaomi Mi 6 company's latest flagship smartphone at an event in China. It has a Dual Rear camera and Snapdragon 835 Processor. 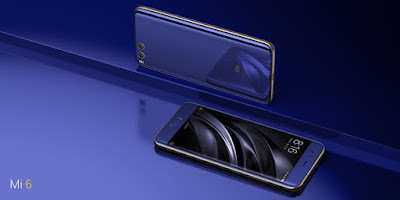 On Design it has a new four-sided 3D glass feature and a glossy stainless steel side wraps the body on the side It looks similar to Honor 8.Xiaomi Mi 6 feature a 5.15-inch (1920×1080 pixels) Full HD display powered by 2.4GHz Octa-Core Snapdragon 835 which is based on the cutting-edge 10nm processor with Adreno 540 GPU with 6GB RAM and 64GB storage nad 6GB RAM with 128GB storage. Dual SIM device runs on Android 7.1.1 with MIUI It has a fingerprint scanner under the Glass on the front. Connectivity options include 4G VoLTE, WiFi 802.11ac dual-band (MU-MIMO ), Bluetooth 4.2, GPS/GLONASS, NFC, USB Type-C whereas Phone does not come with a 3.5mm audio jack.